Managing user permissions is usually done manually. When possible, it is easiest to use cascading permissions so that when a site's permissions change, sites and lists underneath that site will automatically use the same new permissions. The challenge however is that project requirements often call for a more difficult approach! In some cases there is sensitive information that must be hidden or non-editable for certain users. Futhermore, it is not feasible to manually update permissions especially at a list record level. Infowise allows for rules which can update permissions at an item level which would would not be feasible to do manually and would be a difficult challenge to implement using custom written SharePoint workflows. 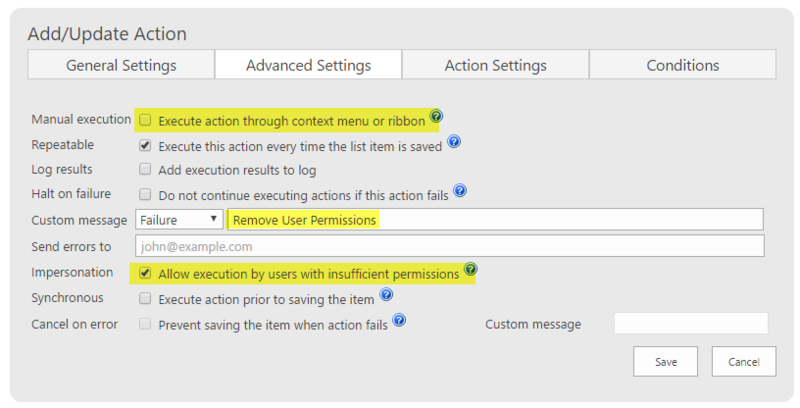 When it comes to permissions in SharePoint, simplest is best. That being said, projects often come with difficult requiremnts that simply don't allow for a simple solution. It is especially tough to create a shared tool that is accessible to two or more groups that should have different permissions and access. Setting and changing item level permissions can be feasible and appropriate depending on requirements. Workflow on a record may change the ownership or nature of infomation. Here is one specific example where this dynamic functionality provide vital: A vendor facing tool needed to be used by multiple vendors. These vendors competed against each other for work. A dynamic rule was needed in order to change the project permission based on the vendor used for the project. Without Infowise actions to dynamically change permissions based on the vendor, the solution likely would have been implemented in a separate site for each vendor. This would have meant losing the many benefits that come with consolidating the information in one location. Surprisingly these competing vendors could access the same list with the same functionality but never look or update other vendor records in the list. The customer was happy because they are able to view all the project records in on location as expected. Managing user permissions CAN be handled dynamically and at an item level. Project often have difficult requirements. Permissions can be especially challenging to implement. Infowise provides a lot of flexibility that would otherwise be extremely cumbersome to implement using custom workflows written in SharePoint Designer.